It is absolutely essential that organisations are catering their software developments effectively for end users. Businesses must understand the performance and availability of their applications. A successful user experience results in satisfied customers and can lead to an increase in growth and market share. Increasingly, the first impression of any software deployment has on end users is critical for determining its success and impacts on brand reputation and integrity. Effective software performance and providing an excellent user experience can provide a sustained source of competitive advantage and attract new customers that competitors find difficult to emulate. This is especially true considering that customers now interact with businesses online at all times of the day and night. Conversely, organisations that do not measure the performance of their software effectively, risk providing an underwhelming customer experience and can lose out on revenue and potential customers. In this article will review how Testpoint manages and supports the end user experience, performance and availability of its customer’s applications, utilising Vansah Synthetic Application Monitoring (VSAM) platform. Businesses face many challenges in monitoring applications that can lead to frustration and financial loss. Without effective monitoring it has hard to know the end users experience and understand when issues are arising throughout the customer journey. Here at Testpoint, businesses frequently approach us to understand how they can obtain detailed performance, user experience analytics and find the root cause of potential issues. Businesses also find it difficult to understand how changes and upgrades to technology are influencing the overall user experience. Furthermore, there are frequent challenges in understanding how applications are performing across browsers and devices. Ineffective testing and monitoring can also lead to security issues that have the potential to cripple applications and the business. Testpoint’s proprietary enterprise VSAM platform helps businesses attain peak performance for their software throughout the user experience. VSAM is a managed service delivered by Testpoint that provides solutions for businesses to help them understand and identify end user experience and performance issues earlier in the development cycle and across live production systems. Live application monitoring enhances the service by monitoring the end-user experience in real time. As a result, by utilising the VSAM platform, your organisation is ensuring the best experience and performance of your systems. Testpoint’s VSAM managed service will dramatically reduce operational costs and at the same time will increase consumer and stakeholder confidence when going to the market with new technologies. 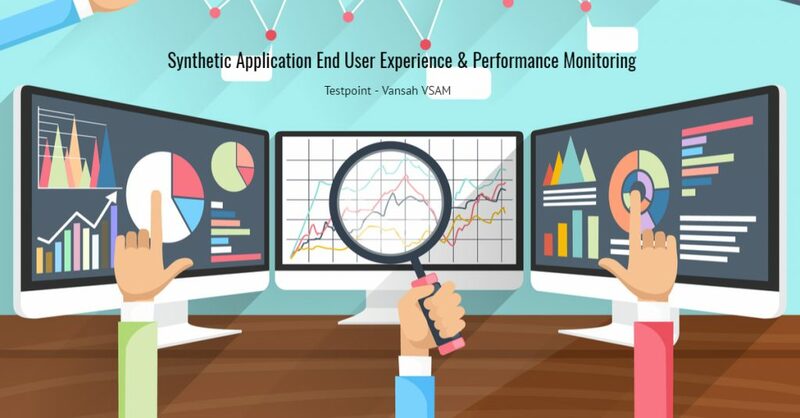 Measure the end user experience across technology – Testpoint’s VSAM platform and managed service is one of the few technology solutions that can measuring the end-user experience from both inside and outside of the firewall and across any technology. Create real insights and visibility – Our approach is based on synthetic (agent-based) monitoring, to simulate any type of business transactions necessary to monitor and analyse response times, quality of service and availability across these transactions. The result is that VSAM can consistently deliver real insights and visibility. Troubleshooting – In addition to capabilities for simply monitoring the end-user experience and alerting IT teams when a problem occurs, Testpoint provides robust capabilities for troubleshooting and resolving performance issues. Identify the root cause of the problem – The combination of proactive monitoring across different applications and infrastructure joined with Testpoint’s managed services ensures we are identifying the root cause of the problem and valid issues are being escalated proactively. Early detection of problems means that solutions can be implemented earlier, whilst problems can still be managed simply, from a cost and operational perspective. Our VSAM managed service will also help your organisation with operational efficiency. Research conducted by Gartner has identified that each hour of downtime can cost an organisation, in some circumstances, over $300,000. [i] Excessive downtime can have serious operational consequences for an organisation. Consumers now expect a certain level of speed when they utilise your applications. A lack of speed and a delay in loading times and operation will cause your customers to turn away from using your platform. Furthermore, a lack of speed can affect a businesses integrity and brand reputation. Slow loading time is a major reason for deserting pages; A single second user delay produces a 7% loss in conversions and a 16% decrease in customer satisfaction for each second. [ii] For most organisations, customers are their biggest voice for championing their brand. Therefore, it is absolutely critical that their end-user experience is a reflection of how an organisation wants to be portrayed. A fast, efficient loading time shows to customers that your organisation is set on providing a quality customer experience. Over the last few years in particular, there has been an increasing complexity in the data centre and application architectures. Technology is shifting towards the cloud and SaaS models swiftly. It further stresses the need to monitor vendor SLAs and organisations need to ensure that you are paying for what you were promised. More than that, your brand reputation is at stake and you need to ensure that your customers’ end-user experience is not impacted. How do you monitor application end user experience across your organization? 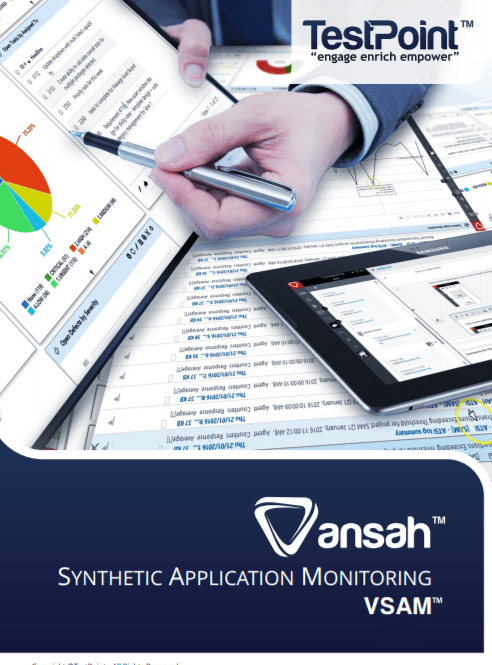 Testpoint have created Synthetic Application Monitoring with Vansah to help organisations carry out efficient and effective monitoring. Testpoint carry out VSAM managed services with a focus on helping organisations understand the experience of the end user and drive the performance and availability of their applications. Identifying issues early in the development cycle provides the ability to respond quickly and efficiently to issues creating a high level of operational agility and reducing costs of deployment and execution. An effective end user experience can help your organisation enhance your brand reputation and online integrity.